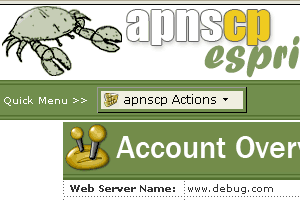 Ironically enough, this screen shot was taken two years after the first apnscp version was released. There was a push to design an entirely new control panel, one without frames. Unfortunately though, the initial design of esprit didn't turn out like we wanted, so it was back to the drawing board for a few more weeks. Frames were officially gone as well. Since no one here knows Latin, German was used as the filler. 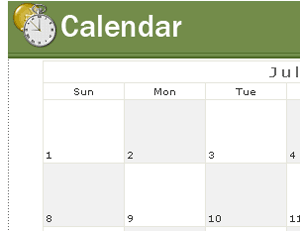 Events were changed from a cluttered linear pattern into a calendar of events. The skin was redeveloped to look similar to the Apis Networks and apnscp 1.0 design. Tooltips were added to offer quick tidbits of help without having to go through and open up a new browser window. The enormous calendar was reduced in size and AJAX was added to display news articles quickly and efficiently. Finally, the trip is nearly complete. 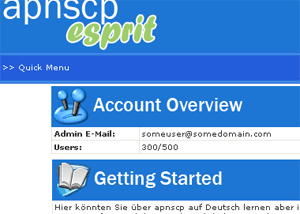 The new design of apnscp esprit represents a new milestone in Apis Networks' constant growth. We set out to solve the problem of constructing an aesthetically pleasing and relevant control panel and it looks like we've finally accomplished that. Look forward to the new trick up our sleeves set to debut officially in Q1 of 2006. Want to see more of esprit? "esprit"? That's a dumb name. "esprit"'s name came about after watching an episode of Top Gear where none other than a Lotus Esprit was showcased. At that time the new name was still tentatively labeled "apnscp 1.5", given this would have been the second iteration of 1.5 to grace production. Some gears began churning and the abstract thought process began. The definition of "esprit" is "vivacious cleverness or wit; liveliness"... well, there were going to be some new grounds broken. This would be the first control panel making heavy use of AJAX and a fully exposed control panel controllable remotely via SOAP. After a few nights rest, the name not only began to sound better and better, but eventually "esprit" stuck. Do you borrow anything in esprit? PHP Layers Menu System: PHPLM is used to consolidate the old frames menu into a quick drop-down list compliant with every modern browser. SAJAX: Life wouldn't be complete without adding AJAX functionality into esprit. SAJAX provides an easy-to-use framework that powers not only the new calendar of esprit, but also the traceroute provision, among others. AJAX grants us the ability to display content inside the browser without having to refresh the page. Noia Icon Set: A beautiful set of icons slightly modified with a brown hue. PRADO: Despite being enamored with PRADO, its performance and bugs held us back. 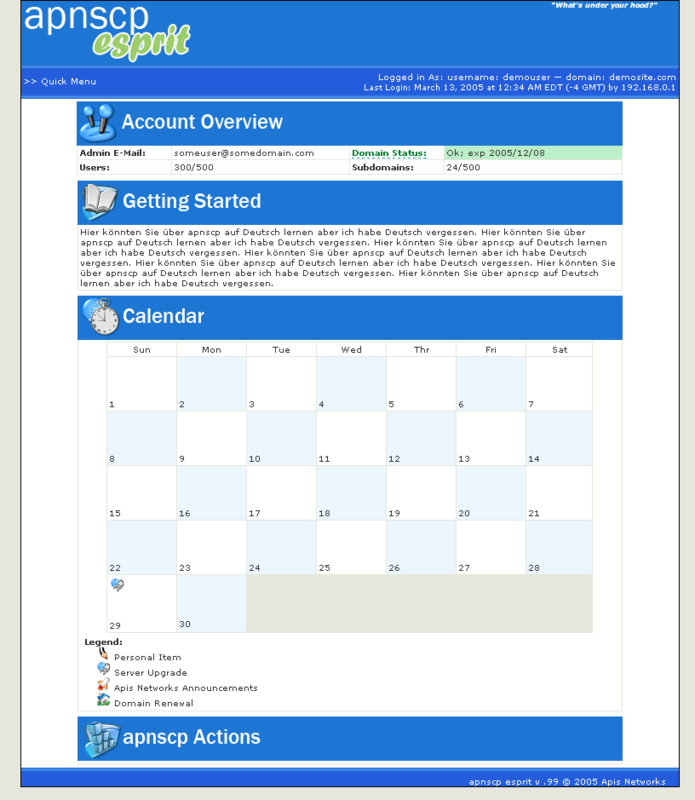 Everything else you see in apnscp esprit is custom-written, including the graphs and dynamic layout of the dashboard.